Question: A client has given me the task of creating a site with the ability to convert their file uploads into html or PDF for storage on the web server. I want them to be able to upload (.doc, .tiff, .jpg, etc) and have it converted these files on the fly, again... into either html or PDF.I am open to software and API's. Any input is greatly appreciated as I have been looking for a long term solution to this problem that I will be able to use in future projects. Is there application which can do this on VeryPDF? Answer: When you need to convert files of word, image and others to PDF on the fly from website, maybe you can have a free trial of VeryPDF cloud bases application named VeryPDF Free Online Document Viewer, by which we can convert files of DOC, DOCX, XLS, XLSX, PPT, PPTX, HTM, HTML, TXT, RTF, HTM, HTML, GIF, JPEG, JPG, PNG, TIF, TIFF, PCL, PXL, PRN, XPS documents to PDF file also. But as it is API application, for now it only can convert one file to PDF each time. Please check more information of this software on homepage, in the following part, I will show you how to use this software. Converting files of word, image to PDF on the fly. 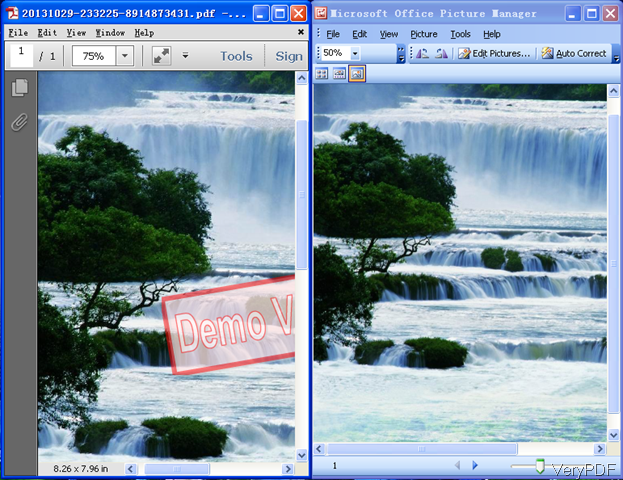 When converting files of word, image to PDF on the fly, please open website of Free Online Document Viewer. Even if we name it as document viewer, but it can help you convert files to PDF. So you can use this application as PDF creator. When converting files by this free online application, please following steps stated on website. The following snapshot is from the website, please have a check. All you need to do is that uploading files both local or online, inputting API code if you have and then click button View Online the conversion will be done at once. Check converting effect from word, image to PDF. After clicking button View Online then you will enter another tab where you can get the URL of PDF, embedded code and other information. Now let us check the conversion effect from the following snapshot. The conversion will keep all the element and effect of the input files. It will not downsample input file quality. Same with other conversion by this application. Please note if you do not have API code, there will be watermark on output and the URL of the PDF will not be kept longer than 24 hours. When you need to convert files of word, image to PDF by API, this application is a good choice for you. During the using, if you have any question, please contact us as soon as possible. How to create TOC or index during converting HTML to PDF? How to take note on PowerPoint directly online free? This entry was posted in VeryPDF Cloud API and tagged image to PDF. Bookmark the permalink.